Joydens Wood is an Ancient Woodland site which supports a wide variety of wildlife. Notably, the site has 9 ponds and these provide home to all three species of British newts. Traces of settlements have been found in the woods and these are over 2,000 years old. The woods also contain the 'Faesten Dic' (Faesten apparently means 'fortress' and dic is 'dyke'), it is known as 'The Strong Dyke'. The dyke is a defensive structure built to keep the Romans of Londinium out of Kent by the Anglo-Saxons approximately 1,500 years ago. In more recently times, during the second world war two RAF Hawker Hurricanes crashed in the woods. There are apparently still some fragments of metal from the planes scattered around the northern parts of the wood. There is also a wooden carving of a crashed Hurricane together with a commemorative plaque. There are also some hollows which are actually bomb craters from the same period. On the evening of the race, I parked on Summerhouse Drive and entered the woods via the footpath between the houses. On the Dartford RoadRunners website, the advice was to allow 10 minutes to reach the race HQ / start-finish area. So that’s what I did, and that’s how long it took to reach it. I’d also dragged along my wife, who had agreed to act as unofficial SLGR photographer for the evening, and my daughter, who was a tiny bit sad that we weren't buggy running. I hadn’t registered in advance so we made our way over to the registration desk, filled in the form and paid the £6 entry fee (very reasonable, I thought). It was great to see quite a few familiar faces including some of my fellow #TeamSLGR club team mates. I chatted to a few people and then had to get on with my warm up, which I had left really late. By the time I arrived back at the start area, things were ready to kick off. I knew this race would be more competitive than the previous week’s mid-week offering, so I lined up a couple of rows back. Also I had decided to pay attention to the advice of another runner I had been chatting before the race who had mentioned how he usually starts this race at a conservative pace in order to not burn out before the final hill, which I hear is referred to as 'Mount Misery' by some of the local runners that train here. 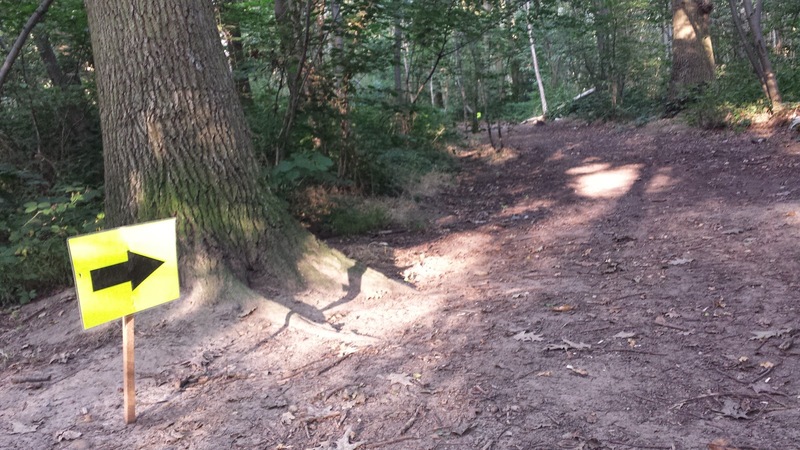 And that’s something else about Joydens Wood – It isn't flat. After a short pre-race briefing, at 7.15pm we were sent off to run around the woods. The race is part of a series, and this one was the third and final one of 2014 – As I understand it, each one is run on slightly different course. There’s the ‘old’ route, the ‘new’ route and also one of those in reverse. I'm not 100% sure exactly which course it was today, but it was well signed and the marshals that were out there were very good, giving clear instructions and offering lots of encouragement. It was a warm evening, but the shade of the trees was a very welcome change to the blazing sunshine of most of my recent runs and races. It’s difficult to describe the course in huge detail, mostly because I am not familiar with this particular location, but it's what you would expect from running in the woods - ie: a trail race and lots of trees. There were definitely a couple of tough uphill sections, plus a few of the downhill sections were scarily steep. It had all of the usual trail hazards – uneven paths, low hanging tree branches, tree roots, and loose stones. 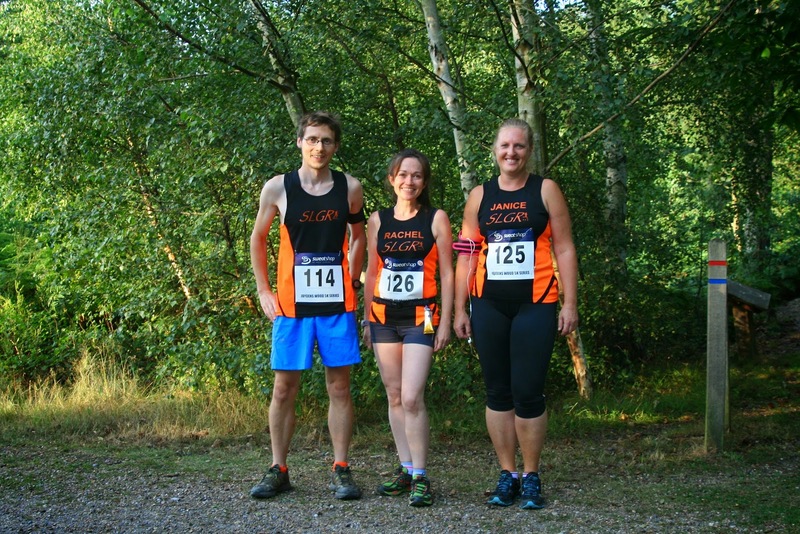 The course had also held onto some water and there were a few boggy sections, which I wasn't expecting in the middle of the summer – I had opted for my trail shoes, so I stayed perfectly upright throughout. A really steep downhill section with loose gravel/stones: I would usually try to fly down these sections but I had to apply the brakes on this one. Still I loved it! A long twisty, slightly downhill zig-zag section through some pine trees: This really was incredible, the scent of the trees was amazing and with it being slightly downhill I felt like I was flowing really well. Underfoot was a dirt path, so it felt a little softer than some of the other sections. The final incline - 'Mount Misery': This is the part that I was advised to save some energy for, and from the bottom it looked like an endless uphill section. There was a tiny bit of relief where it dips slightly towards the end, but in the final 100 metres or so, it returns to being uphill. I had no idea what position I was in throughout the race. This was down to the course being quite twisty, and most of the front runners were always out of sight (and eventually a few minutes in ahead). I found a nice, comfortable spot behind a Petts Wood runner (115) and spent the majority of the race behind him, occasionally swapping positions. During the second half of the race, we caught and passed a few of the faster starters that had run out of steam and were not maintaining their original paces. I finished fairly strong, managing to overtake my Petts Wood race companion about 400 metres from the end while negotiating the infamous Mount Misery. I was also gaining on the two runnners in front of me, but they managed to cross the line just a few seconds ahead. Post-run was no different to any other 5k – find some water and crash out on the floor for a few minutes. There was a very friendly atmosphere and there was lots of hand shaking taking place. I really enjoyed it. I had recorded my run on my Strava app and on my new Garmin , I knew that my finish time was somewhere around 20.30 – about two minutes slower than my current flat, fast course 5k time, but it wasn't until a few days later that I found out my official result. This is definitely a race I’d do again. In fact, in future years I would really like to sign up for the whole series. Somehow I hadn't got the memo about the first two and missed out on them, which is something I regret. Joydens Wood is a great place to run and I look forward to doing so again in the future. Thanks to Dani for taking the photos. Also thanks to Dartford Road Runners for organising and thanks to all of the volunteers that helped in some way on the evening. This was another reminder that the running community in and around Dartford is fantastic.